Fear is a fundamental aspect of predator-prey interactions, motivating prey to alter their behavior in an effort to reduce the risk of death from predators. Ecologists are increasingly realizing that such predator-induced fear can have far reaching-effects across ecosystems by affecting where and how prey spend their time, and that preserving natural “landscapes of fear” may in some cases be an important conservation goal. Yet human activity can disrupt these natural fear regimes, with potentially negative consequences for wildlife populations and ecological communities. 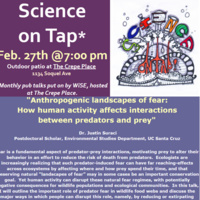 In this talk, I will outline the important role of predator fear in wildlife food webs and discuss the major ways in which people can disrupt this role, namely, by reducing or extirpating predator populations, and by acting as predators ourselves. I will draw on examples from raccoons and large carnivores on Canada’s Pacific coast, African lions in Kenya, and pumas and other wildlife here in the Santa Cruz Mountains to illustrate the causes and consequences of human-induced changes to landscapes of fear and the importance of considering wildlife behavior when making conservation decisions.